Congressman Flores explains how tax cuts affect the deficit. Congressman Flores discusses immigration visas. The Congressman talks about Congresswoman Pelosi's statements on tax cuts. 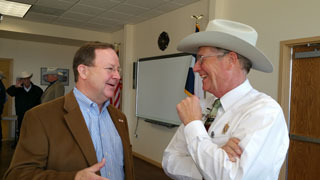 Congressman Bill Flores held an Access Live event to hear from constituents about important issues facing the nation. Topics of discussion included the economy, unemployment, border security, human trafficking, tax breaks, and climate change.